This month's Royal Foodie Joust called on all of us Foodie Blog Rollers to come up with a dish that incorporated oranges, sage and acorn squash - a very interesting flavor combination. At first I was stumped. Having never even cooked with acorn squash before, I knew this was going to take some thought. Plenty of pumpkin and butternut squash have passed through my oven, but never an acorn squash. When I started brainstorming, I wanted to figure out something that would really let both the orange and sage flavors shine through in the main component of the dish and not just as an afterthought. 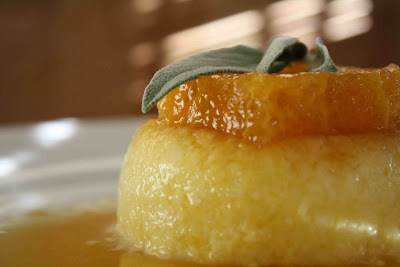 After mulling over several ideas, I set out to create an acorn squash creme caramel. The sage would be steeped in simmering milk to infuse its flavor into the dish and the fresh-squeezed orange juice would be added to the acorn squash puree. Both flavors shined through in the finished product. To check out the Royal Foodie Joust, or to join The Foodie Blog Roll, head on over to the The Left Over Queen. I highly recommend it! Bring 2/3 cup sugar, cream of tartar and water to a boil in a heavy bottomed sauce pan. When sugar mixture begins to brown lightly, remove from heat and mixture will continue to cook until a caramel color is achieved. Pour sugar mixture into six five-oz ramekins to cover the bottom (Note: You may not use all of the sugar mixture depending on the width of your ramekins). Place milk and cream in a medium sauce pan and bring mixture just to a simmer. Remove from heat and stir in chopped sage leaves. Set aside to steep. Combine eggs, egg yolks and remaining 1/3 cup sugar in a bowl. Puree the acorn squash in a blender to get a smooth consistency. Combine squash with sugar and egg mixture. Once milk mixture has cooled, strain it into the acorn squash mixture and mix to combine. Pour custard into the prepared ramekins until 4/5 full. Place ramekins in a water bath and bake for 40 - 45 minutes until only a slight jiggle remains on top of the custards when you move the pan. Place custards in the refrigerator and cool for at least 12 hours and up to two days. Turn upside down on a plate to unmold, dipping the ramekins in hot water for a few seconds to loosen if necessary. Top unmolded creme caramels with orange segments and sage leaves to serve. Enjoy! Looks delicious. That's a great combination of ingredients! Good luck! How beautiful!! I can almost taste the custard from looking at the picture. Best of luck in the Joust this month. Very intriguing combination of flavors! Love it! Nice use of squash, sounds great. Also wanted to let you know you've been tagged on my site. Ok, this looks beyond delicious!! YUM! that looks sooo delicious. and gluten free to boot! and beautiful photo by the way! What a unique and tasty idea :). I bet it smelled delicious. I like the way you incorporated the sage. This is gorgeous (I feel like I say this in response to all of your posts haha)- nice work! Wow that looks absolutely to die for!!! Best of luck in the Joust!!! That is such a great entry! I am in awe.